'Battle Chasers' to Return After 14-Year Hiatus! Fantastic art, a brilliant story that kept me interested and amused. A while back (over a year, to be exact) I got to read the first issue of Willem Samuel’s Mengelmoes; a comic that follows his life and (mis)adventures at various stages, in a realistic and familiar manner. We’ve all been there at least once, whether it was arguments with our family and friends or pining over a lost love for much longer than it was warranted. This is one of many factors that makes this comic an easy, nostalgia triggering, read. Leaving aside the brilliant art, each issue of Mengelmoes also offers insight into a world that for the most of us is unfamiliar: South Africa’ It’s not a country I’m too familiar with and Willem Samuel’s book provided me with an interesting way of looking at its history, as it unfolded, through his eyes. Interspersed with small bits of his own personal history, these lessons are easier to incorporate, giving the reader a way of seeing how what the rest of the world judges without enough information, affected those present for every single political shift. But that’s not the main focus of Mengelmoes. Mostly, while still being a window into a world that we only ever see rarely portrayed (moderately accurate) on TV and in other media, this comic is still a half-realistic, half-fantasy depiction of a coming of age story. We see Willem evolve from a young teen to an eighteen year old with love problems and a poor way of dealing with them, we see his struggles and how his choices shape up who he becomes. 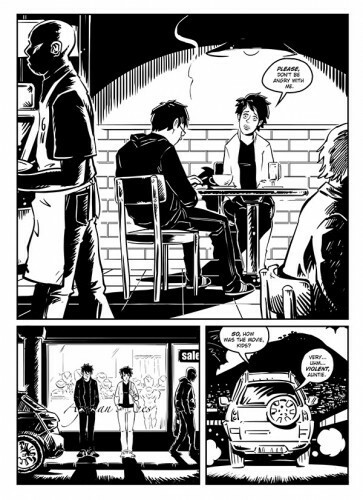 Since issue 1 the main character labelled himself as a bit of an outsider, seeing the world in a way that didn’t fit the norms of his school or of the world around him and that hasn’t changed. His rant against God and the way he is used to push forth ideas that most rational minds would reject or find iffy, if not shrouded in religious propaganda, was one of the best things in The Matric (Mengelmoes second issue). Issue 3 (The nouveaux flat complex) brings forth the way most young people are disillusioned with life at university, where they discover that not much has changed, that they aren’t surrounded by wonderful debates about everything important, but are instead caught in the same type of monotony as before, only they are slightly older and with a lot less parental supervision. Willem and his friends aren’t portrayed as heroes. He makes mistakes, he’s an arse, those around him aren’t any better, but it all ties up together nicely in the end. The style of Mengelmoes, while relatively constant shifts ever so slightly as the characters grow and the world around them changes. 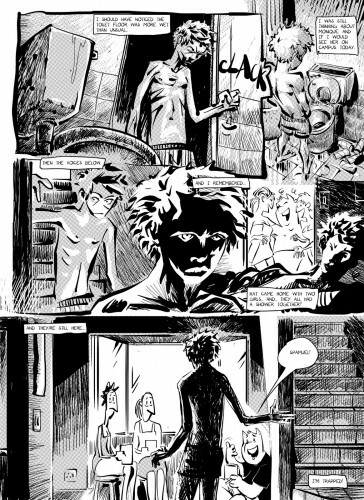 The third issue, which more or less presents Willem at his lowest yet, has a distinctly darker tone than the other two issues, maybe as a way of showcasing both his own skewed perception of the world (through the haze of drugs) and as a way of portraying his ongoing disappointment with his life. Issue number 4 – The Exhibit – is soon to come out and I’m anxiously waiting for it. So far Willem Samuel didn’t disappoint, both in terms of story and art and with three more issues to go, I doubt he will. My advice? Get reading, you’ll like it! And even if you don’t? you’ll at least learn something new.